TONS OF OPPORTUNITY WITH THIS 7.12 ACRE PROPERTY!! The large home features an open concept design with stunning vaulted ceilings on the upper floor. 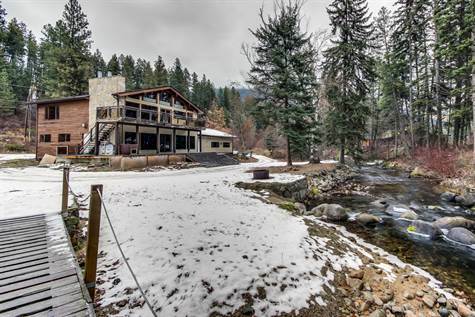 Enjoy total privacy on the deck that overlooks the tranquil creek running through the property!! The lower level features a huge rec room & access to the AMAZING 40'X35' SHOP/GARAGE with over height doors. There is room for all your toys, boat, RV, & vehicles!! The upper portion of the property is approx 5 acres with TONS OF POTENTIAL...there are many gravel pits in the area - other permitted uses may include greenhouses, sawmills & agriculture ect.